Interest for Vallastaden 2017 before it has even opened suggests that it will attract large numbers of visitors. LiU is right next door to the exhibition. How will the huge interest in Vallastaden 2017 affect us who work here? What are the opening hours of the housing and social planning exhibition? Vallastaden 2017 opens on 2 September and closes on 24 September. It is open Monday to Friday 10.00 am-7.00 pm, Saturday 10.00-5.00 pm. The entry fee for the exhibition area is SEK 100 for adults, with free entry for children under 16 years. Industry-specific tickets are also available that give access to lectures and guided tours. Are there any free tickets for LiU co-workers? Unfortunately not. LiU co-workers must pay the normal entry fee. The company organising the exhibition has set a high target: a total of 100,000, of which 10,000 are expected from industry. Interest before the opening, however, has been extremely high, and large numbers of visitors are expected. The maximum number of people allowed on the site is 15,000 per day, which is to include not only visitors, but also residents and those who work in the properties. How will the exhibition affect accessibility at LiU with respect to campus entrances and exits, parking and increased traffic? Is there anything in particular that I should think about? The exhibition area is nearest neighbour to Campus Valla, and clearly the large number of visitors in September will make their presence felt. The organisers are hoping that many visitors will use the Östgötatrafiken buses to travel to and from exhibition, and additional buses will be deployed if necessary. It is probable that many visitors will travel by car. 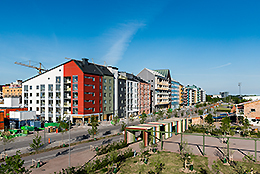 Signs from the E4 will direct cars to parking at the eastern end of Vallastaden, with entrances from Lambohovsleden at the Åsmestad roundabout. Visitors with local knowledge may feel tempted to park on Campus Valla, and this may affect co-workers at LiU. Can LiU co-workers help in any way, working at the exhibition? If so, whom should I contact? LiU has five exhibitions at Vallastaden 2017, and all of these require personnel to be present as hosts outside and in the apartments. No special knowledge is needed: the work essentially involves simply helping visitors to find their way, and ensuring that the number of visitors at any time does not exceed the maximum permitted. Which areas of research, education or other activity will LiU be exhibiting? We will primarily be exhibiting fields of research and education that have a natural connection with urban and regional planning and the way people live. We will have exhibitions in four show apartments. We will also demonstrate a teaching facility of the future, the Active Learning Classroom, and a showroom in which the various fields of research are presented in a manner designed for the general public. Can I give my courses in Vallastaden during the exhibition? If so, whom should I contact? Are there any new restaurants or cafés in Vallastaden? Can LiU co-workers get into the exhibition and eat there? Several foodtrucks will be set up close to the exhibition site and anyone is, of course, free to buy food from these. In order to buy food at the restaurants and foodtrucks inside the exhibition, however, it is necessary to pay for admission. What directions should we give to people who can’t find the exhibition? Is there a main entrance or reception that people should use? The exhibition will have two clearly signposted entrances: one at the Lambohovsleden entrance, and the other at Nobeltorget. It is, unfortunately, necessary to take up the question of safety – how rigorous will security checks be during the exhibition? The complete site is fenced and will be subject to round-the-clock surveillance. At the same time, however, it is a residential area where tenants, tradepeople and several other professional groups must be able to live and work as normally as possible during the exhibition. For this reason, there will be adequate security personnel at the entrances to help everyone in the best possible way.